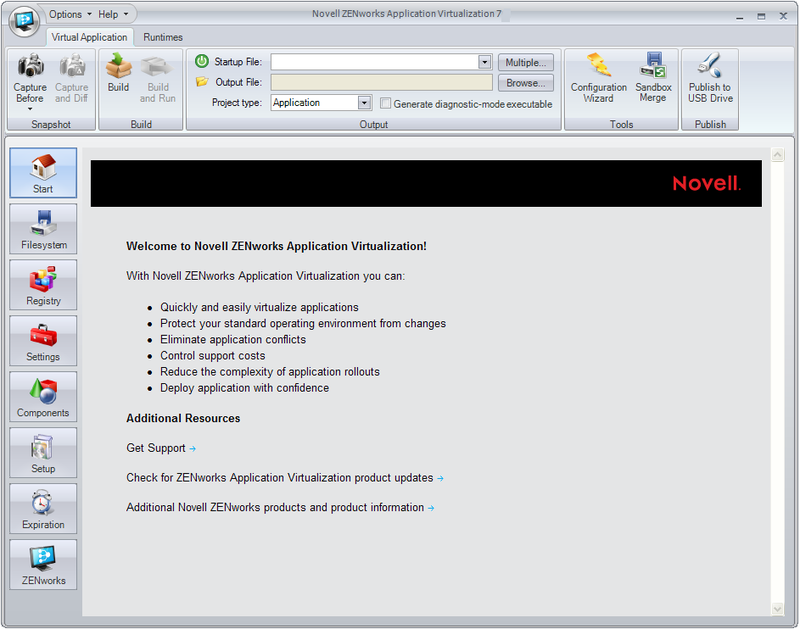 The section contains step-by-step information to help you use Novell® ZENworks® Application Virtualization to prepare Novell GroupWise® and GroupWise Notify to run as virtual applications. You can prepare a clean machine by uninstalling GroupWise and GroupWise Notify. However, we recommend that you start the process on a machine that has only the desired Windows OS, any applicable OS service packs, and ZENworks Application Virtualization installed. Starting with a machine that includes only these items helps to ensure that your virtual application does not contain settings that might cause conflicts. Install GroupWise on the clean machine. For installation instructions, see the GroupWise Documentation Web site. Depending on the version of GroupWise that you want to deploy in your environment, click the appropriate link, then locate and display the Installation Guide. (Conditional) If you plan to use the GroupWise Caching mode or the Archive feature, click the Filesystem button on the left side of the ZENworks Application Virtualization console, then add the sandbox data area folders you want to embed in the application executable to store cached or archived data. For example, you could created a Cache folder and an Archive folder for users. Caching mode stores a copy of a user’s network mailbox, including messages and other information, on a local drive. The archive saves mail or phone messages, appointments, reminder notes, or tasks to a designated database on a local drive. For more information, see the GroupWise Documentation Web site. Ensure that you have enough disk space in your ZENworks Application Virtualization sandbox to store that mailbox. For information, see the Configuring the sandbox location topic in online help (click Help > click Novell ZENworks Application Virtualization Documentation 7 > expand the Virtual Application Customization book > click Configuring the sandbox location) or see the Editing the virtual filesystem topic in the online help (expand the Configuring Virtual Applications book > click Editing the virtual filesystem). Click the Multiple button on the right side of the Startup File drop-down list to display the Startup Files dialog box. 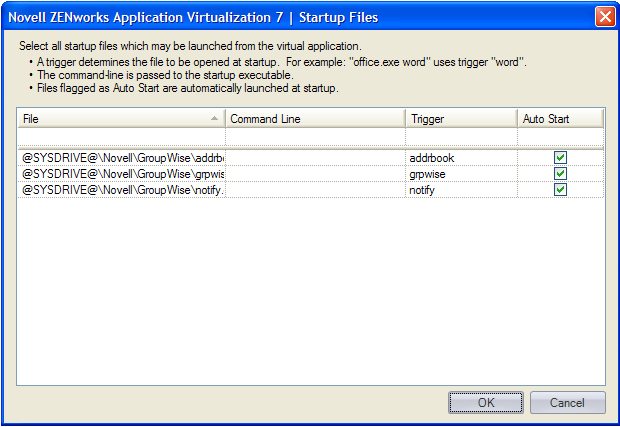 ZENworks Application Virtualization lets you launch both GroupWise, GroupWise Notify, and the GroupWise Address Book when users click the virtual application executable file. Click the Auto Start check box next to the desired files so that they always automatically launched on virtual application startup, then click OK.
Users must authenticate to the GroupWise system after they launch the virtual application. The virtual application executable, as configured above, does not populate the username, password, or post office information. When the user logs in to the virtual GroupWise application the first time, the user can choose to save this information. Users can use the virtualized GroupWise application on a machine that already has GroupWise installed. However, both instances of GroupWise cannot run at the same time. The authentication and post office information for the installed instance are not used for the virtualized instance of GroupWise. The virtual executable file can be used to run GroupWise in Online, Remote, or Caching mode. For more information on these modes, see the GroupWise Documentation Web site.